One hundred and fifty years the most momentous struggle in American history began, when Confederate Gen. P. G. T. Beauregard ordered the bombardment of Ft. Sumter in Charleston Harbor. U. S. Major Robert Anderson, after a day and a half of shelling, surrendered and evacuated the fort. Thus commenced a singular war which would shape American history like nothing else. Most who have studied the war have been instantly drawn in by its haunting power. Here is human history concentrated. Tragedy, heroism, honor, folly, fanaticism, rapacity, cruelty, greatness, heartbreak: the student will find all of it, in abundance, in the four year contest of will that began at Ft. Sumter one and half centuries ago. What he will not find is a story that admits of easy summary or simple explication. The motives that drove men to wage this war are every year more obscure to the modern mind. The almost absurd picture of one general approaching his opponent under a flag of truce to request advice in the coming battle indicates our distance from the sense of honor that bound so many of these men. Even the basic attachment of patriotism, always essential to any estimation of the war’s import, is occluded by the nationalism that in time supplanted it: few of us today have any real contact with that passion of love and loyalty being fixed by one’s native state. The America that was torn asunder by the Civil War is long gone. A rebellious section, fancying itself a new nation, failed to make good on its claim of independence by trial of arms. But the victorious North, too, would never be the same; and justice in law for the oppressed in the South would be postponed for another century. Of the men who fought this war, from the private soldier to the general officer, prosopography concerning them forms a considerable part of our literature. Well it should. I have been most impressed with The New York Times’ blog Disunion, which draws on “contemporary accounts, diaries, images and historical assessments to follow the Civil War as it unfolded.” I invite readers to include in the comments their own recommendations for readings on the Civil War. It isn't about the war itself, but I consider this to be one of the best chapters in abolitionist literature. A few years ago I read Shelby Foote's epic three volume narrative history of the Civil War. I believe it's a scholarly and well written account. James McPherson's Battle Cry of Freedom, first published in 1988, had some enthusiatic reviews and I'm thinking of ordering a copy from Amazon. Is there a 'definitive' general history of the conflict which can be recommended to a British dilettante on the 150th anniversary of the opening shots? Ah, the war between the states. We went in a confederation, and came out an empire. Here is a general Southern reading list from Clyde Wilson; not just on the war but contains a section. A former student of mine is involved in a blog that covers the war from an "as-it-happened-150-years-ago" perspective. It's the Civil War Daily Gazette (http://civilwardailygazette.com/), and it's worth your time. R.L. Dabney's "A Defense of Virginia and the South" is good. As a general introduction to the war, I think McPherson is doing a pretty good job for one volume (I'm reading it right now). I too read Foote's three volumes and fell in love. One thing about Foote that I think is important to note -- he is a good military historian and story-teller. More than anything else, I learned from Foote how incredible the Southern generals were and how lucky we in the North were that Stonewall Jackson was killed by his own men (and Longstreet was wounded). I'd recommend watching the series if you've never seen it -- the photography is amazing and Foote is a regular commenter! Here's my pics. The last two or three on politics are crucial in my opinion. I think much of American history is unfathomable without understanding the politics of the postwar age, certain perspectives of which I think we've accepted quite uncritically. "The more educated Americans become, the more they read Henry Adams; the more educated they become, the more they see things as he told them they would. The more readers Henry Adams has, the more things become like they seemed to him." --Robert Dawidoff. Thanks everyone for the recommendations. I know there's books enough for a lifetime's reading about the Civil War. I think I shall begin (again) with James McPherson's book, though I've just ordered The Impending Crisis by David Potter to get an overview of antebellum America and to get a handle on some of the many political considerations that provide a context for the war. In Battle Cry of Freedom McPherson is much better on the war itself than he is on the events that led up to it. Being the big government liberal that he is, he gives the North (i.e., the federal government) the benefit of the doubt in virtually every instance of political disagreement between N and S leading up to the war, which makes for quite a biased telling. No one should miss Robert Penn Warren's little book-length (100 pages or so) essay The Legacy of the Civil War, which was commissioned by Life magazine for the war's centennial in 1961. By the way, the title of Paul's post strikes me as highly ironic, given the fact that there are those of us who credit the Civil War with the birth of the American Leviathan. Also Mark Noll's The Civil War as Theological Crisis is an excellent look at the religious issues surrounding the conflict. I've just ordered The Impending Crisis by David Potter to get an overview of antebellum America and to get a handle on some of the many political considerations that provide a context for the war. Alex: This is on my list to read. I think it is a good pick because of high recommendations from many sources and I look forward to reading it for the same reasons you give. Rob: I think a few would wish they'd missed it. The genesis of the book (which I didn't know until now) explains its confused nature and how it tosses out ideas seemingly to appeal to many groups only to express an agnosticism of the truth of the matter in the next sentence. It has no real center, no real view it is advancing. It reminded me of a poem more than an essay. One I forgot to add was :Themes of the American Civil War - Edited by Susan-Mary Grant. A collection of essays well worth the time. If one comes away from Warren's little book with an understanding of the South's "Great Alibi" and the North's "Treasury of Virtue," that's plenty. The fact that it has a certain poetic quality is to my mind no liability. "Being the big government liberal that he is, he gives the North (i.e., the federal government) the benefit of the doubt in virtually every instance of political disagreement between N and S leading up to the war, which makes for quite a biased telling." Being the small government conservative that I am, who nevertheless believed like Lincoln that slavery was evil, I tend to come down on the side of the North as well. I don't want to fight those battles here in the comboxes, but it is not clear to me that one has to be a liberal (or a conservative) to take sides on the question of slaves in the territories, fugitive laws, the Dredd Scott decision, etc. I'd put it this way, Jeff. While the Southern states seceded primarily (but not exclusively) over slavery, the North did not invade them over that issue, but over the desire to keep them in the Union. In the process the federal government's power was greatly expanded (remember that the newly formed Republican Party was built on the ashes of the Whigs, who were in favor of a stronger federal government). This is, of course, to be expected during a war, but the thing is that much of the power accumulated by Washington during the war became ensconced there and was never subsequently diffused. Whether this was intentional or not is the subject of debate. I tend to think that it was, given the GOP's pro-government and pro-industrial policies. But in any case liberals of McPherson's stripe thus see the good of the war not only in the eradication of slavery but in the expansion of power of the federal government which effected that eradication. I think we can all agree that the elimination of slavery was a good thing. I just happen to have grave reservations about how it was accomplished, and about the other results of the war. To put it another way, I believe that the intent of the North in the war was to save the Union in order to industrialize the South and bring it into the North's already developing big government/industrial economy. Of course the elimination of slavery was a necessary part of this effort, but it was in no way the main intent. What McPherson tends to do then is always to discount the South's objections to the expansion of federal power and an industrial economy as being largely smokescreens for a defense of slavery. Part of this is no doubt due to his strong anti-slavery position, but another part comes from his pro-government/pro-industry view, which finds the South's resistance to these things hardheaded and retrograde. Jeff: 100 percent with you. Small gov Reaganite myself. Rob is way off in impugning the scholarly credentials of McPherson. A scholar who can't transcend his politics to look dispassionately isn't a scholar at all though we all have biases I've read mcpherson and your attacks are misguided You're just spreading FUD, and slander given mcperson's reputation and credibilty. Oops. Last part of the para didn't make clear I was addressing Rob. Using my iPhone. I'm am doubtful of that conclusion. Foote doesn't claim that and I've never seen any CW author claim that the North was intent on forcing the South to industrialize. At best, the North wanted to keep the South as a captive market since the industrial North supported high tariffs. If anything, the North was happy for the South to stay agrarian and dependent on Northern goods. I think Foote probably describes it best. Lincoln was focused on one thing only, saving the Union. If keeping slavery would have done that, he would have kept slavery. Ending slavery, helped his cause and he did that. Slavery may have been an immoral in Lincoln's mind, but saving the Union had priority. I don't think many in the North were looking for a vast expansion of government power or to force any sort of regime on the South. Those claims seem reserved for the neo-Confederates and revisionist history. Rob, are you aware that James McPherson the Pulitzer Prize-winning historian of the CW and this guy are NOT the same person? Your claims of partisanship for the CW historian are pretty far fetched so I can't help but wonder. "your attacks are misguided You're just spreading FUD, and slander given mcperson's reputation and credibilty"
Whatever. I don't even know what FUD is. God forbid I try to present a different perspective from the received version. Should've known better and kept my goddam mouth shut. Peace out. Rob -- The post's title comes from a Bob Dylan song, one written and recorded for the film Gods and Generals. "Rob, are you aware that James McPherson the Pulitzer Prize-winning historian of the CW and this guy are NOT the same person?" Gee, Mark, I dunno. Are YOU aware that Univ. of Va. history prof Gary Gallagher and this guy are not the same person? 2. The legal authority to secede is not co-extensive with the moral right to secede - a state could chose wrongly to secede, as a result of bad motives and / or bad political judgment. 3. Secession over retaining slavery permanently would be a bad motive. 4. Judging whether a state's secession is worthily decided or is a morally and politically undue act cannot be a judgment belonging to the federal authority. 5. Lincoln acted against his writ of authority in arresting the Maryland legislature, which was not (yet) in defiance of law, the Constitution, or the federal union. "I don't think many in the North were looking for a vast expansion of government power or to force any sort of regime on the South." See, for starters, J.R. Hummel's Emanicipating Slaves, Enslaving Free Men and Susan Mary Grant's North Over South. Rob, even if the North wanted to emancipate slaves primarily as a form of imperialism (which would be debatable forever and a day given the way people usually have mixed motives), is there a reason for thinking that this form is gravely different than the sort of imperialism the South exhibited in trying to get slavery extended to the territories? Seems to me that everyone tries to extend their sphere of influence and tries to "help" others be just like them. This is not formal imperialism - i.e. a type of direct subjugation - it is a softer kind of thing: in making the other party over into something just like yourself, you end up making a co-equal and competitor, not a permanent second-class tributary to the polity. I haven't read either of the books you mentioned, so my data is limited. But I cannot recall reading anything that suggested the North wanted to make the South into a permanent possession. I love your persistence and thank you for your thoughtful response to me and my defenders! I actually don't have much to say to your 2:06 PM response as I think you make many good points, although as many have already said, I really doubt folks went to war in the North to industrialize the South (on the other hand -- I think you are right that they did like the expansion of federal government power and mercantilist policies). Anyway, I kind of think you missed the point I was trying to make, which was I haven't detected any bias in McPherson's history of "virtually every instance of political disagreement between N and S leading up to the war". These political issues mostly have to do with slavery and can lead to topsy-turvy political alignments. For example, the issue of the Fugitive Slave Laws -- here the South loved Federal Power and wanted to use it aggressively to enforce their property rights in their slaves who fled North; and the North were suddenly States Rights advocates who loved their State Constitutions that granted slaves freedom and they claimed that the South had no power to enforce their laws in the North. As a legal matter, just from reading McPherson, I think the South had the better case, and I'm a fierce Union partisan, so I think it is hard to make the case that McPherson is all that biased when discussing the political issues of the 50s! Jeff -- I recently reread the first 150 or 200 pages of Battle Cry and was struck by the consistency in which McPherson sides with the North on the various political questions. When it comes to slavery, that's to be expected, and of course the South did itself no good by, in many cases, defending slavery in some manner when debating these issues. But I think that on many of the other matters the South did in fact have a point. To my mind McPherson seems hesitant to grant that. My point about his liberalism has to do with the fact that he is very much a historian in the Schlesinger school, about whose liberal bona fides there should be no doubt. My frustration comes from seeing conservatives accept almost uncritically a historiography developed by their ideological opponents. We manage to register a certain amount of suspicion w/r/t liberal analysis of other historical events -- the founding, the Depression, etc., but when it comes to the Civil War all that hesistancy seems to go out the window. "I cannot recall reading anything that suggested the North wanted to make the South into a permanent possession"
The progressives in the rapidly industrializing North viewed the agrarian South as an obstacle to American "progress." So it's not so much that the N wanted to possess the S, but that they wanted to force it along the same progressive path that they were following. The imperialism desired was cultural and economic -- an infant form of "nation-building." The imperialism desired was cultural and economic -- an infant form of "nation-building." I can see that this might have been the case (I need to be far better educated about the facts, so I am hesitant.) So I ask you, is THIS the kind of imperialism over which to secede? If Party A wants to rope Party B into A's form of economic and cultural model, the proper response by B (if B's cultural form is right and A's is not) is to reverse the tables and try to co-opt A into B's model instead. Marketplace of ideas and all that. The South would have been right to walk away from a union that guaranteed they could never succeed in winning in that marketplace, only if (a) the South's existing model were definitively in the right, and the North's was not, and (b) the difference was important enough to rend a people forming a close alliance and (as a natural consequence) constitute opposed neighbors trending toward war. Since the South's culture and economy was rooted in slavery, it is difficult to see how it could have been the basis for (a) being true. My opinion is that states have the right to secede, but the South should not have exercised that right given the situation, and that the Union should not have waged war to reverse that secession, which was technically legal though morally wrong. "My opinion is that states have the right to secede, but the South should not have exercised that right given the situation, and that the Union should not have waged war to reverse that secession, which was technically legal though morally wrong." That approximates my own view, Tony, although I'm inclined to give the South a bit more slack, seeing that slavery was only part (albeit the biggest part for sure) of its complaint, which was concern about its larger cultural and economic fate. This is why I believe that many Southerners who had no personal stake in slavery still decided to secede and then to fight. It's also important to remember that at the time of the war, a great many people held the notion that loyalty to one's state took primacy over loyalty to the Union, which was viewed as something of an abstraction. Hence Lee's refusal to wield his sword against his fellow Virginians, etc. In our day this seems almost impossible to imagine, given the fact that the states nowadays are little more than deputies of the federal government. Such was not the case in 1861, and we will err greatly w/r/t to "loyalty" if we forget or minimize that fact. a great many people held the notion that loyalty to one's state took primacy over loyalty to the Union, which was viewed as something of an abstraction. Rob, I have tried to become more attuned to that notion, recognizing that my own sentiment has been colored. However, I have to question just how much of a reality that was back then. Here's the rub: some 80-odd years earlier, Pat Henry declared in Congress assembled that "I am an American first, and a Virginian second." Let's grant for a moment that he was being at least a little (or a lot) of a rabble-rousing demagogue. Still, his declaration could not have been held in esteem, and would not have passed down to us, had it not held enough truth for it to resonate with many people. In the intervening decades, the truth would have grown still more valid as the country became more and more co-mingled in enterprise (multi-state entities like railroads and telegraphs), in peoples (migrations and internal travel), in language (German and Dutch giving way to English) and in history. It could not possibly fail to be the case that the idea of Henry's would be even more real in 1860 than in 1774. So, who was more right: Henry, or Lee (both, ironically, patriots of Virginia)? I don't think many in the North were looking for a vast expansion of government power or to force any sort of regime on the South. See Susan Mary Grant's North Over South. Grant's thesis is considered provocative and controversial, which is well and fine. But it is exceedingly weak. We should disabuse ourselves of the common liberal notion that we can analyze events in terms of politics alone. This is surely folly. Cultural forces are at least as strong as political. If the North had an intention to distance itself and impugn the South, how do we account for Southern separatism, of which there is abundant evidence? The book "Gospel of Disunion: Religion and Separatism in the Antebellum South" has a good deal of direct quotations from Southerners themselves to cast in doubt the idea that separatism wasn't an extremely strong Southern position. How do we account for the fact that all the major denominations split over slavery, and that Southern leaders cast the North in the role of a corrupt society, even going so far as denouncing it from pulpits all over the South as theologically heretical? The evidence of the strength of Southern separatism is quite abundant, and I'm supposed to believe that though the Northern and Southern Churches split over slavery a decade before, that the politicians wouldn't do the same under pressure? If the Southern churches had accepted that slavery was not a positive good, the church splits never would have happened. Here is what the editors of the Central Presbyterian of Richmond had to say on November 17, 1860, a week after Lincoln won the election when people in the deep South were contemplating secession. Is it to be wondered at then that the people of the South are not all prepared tamely to submit to the issues of the day? The Southern Presbyterians did not do it - the Southern Methodists did not do it - the Southern Baptists did not do it. And as they are of the people, and with the people, it is passing strange that their example given years ago, has not been read with greater profit - an example which serves to show that the same cause which has produced sectional disruptions in ecclesiastical brotherhoods, may also rend asunder the brotherhood of states. Tony, I see it this way. The right of revolution is a natural (moral) right. The Founders, Lincoln, and everybody who was anybody thought so. But there is no right to secede, legal or moral. Secession is not a right, nor a power, let alone one delegated in any way. As far as whether the Union should have waged war to prevent secession, I think the idea that it was a live option not to do so rests on just the sort of faith in progressive "Whig History" that Rob decries. In other words, Lincoln was right that the nation would be either all slave or all free. The Fugitive Slave Laws were the obvious clue that the active participation of the North in slavery was required for slavery to continue in the South. Northerners actually picked up guns and fought over this issue as individual citizens before the war. If the Northern slaves were freed (as it was on a path to do) and the Southern slaves were not, to maintain the institution of slavery would require a more deeply militarized South than it already was employing even a higher percentage of otherwise productive men to keep slaves from escaping. It won't be popular to say this, but the South was turning inward on itself and was so fully committed to their way of life supported by slavery that tyranny was the only option for them to maintain it without Northern cooperation and participation, which they were increasingly unwilling to do. The North could not free their slaves without Southerners also doing so without radicalizing entirely, which would mean a hostile Confederacy next door. Think East and West Germany, and what happened when the guards stopped shooting people who wished to escape. The same will happen in Korea one day. And the South clearly knew they could not maintain the institution without Northern participation by forcibly returning escaped slaves. In my opinion, the idea that doing nothing was a live option at all for the North rests on rosy progressive understandings where time fixes everything by magic. There is no historical precedent for anything like the rosy scenarios envisioned by critics of Northern suppression of the secessionists actually working out. The Constitution isn't a suicide pact. In my opinion, it would have been gross moral negligence for the North NOT to have fought the war to reunite the nation. The Southerners were actually quite brutal to the Unionists in the South. There were brutal retaliations of Unionists in East Tennessee and other states, far more severe than actions by the Union against pro-secessionists. Why would Lincoln have been justified in ignoring their plight? Didn't he swear an oath to uphold their Constitutional rights? And who spoke for the South? Did the Southern Unionists have no voice in the matter? The South wasn't as unified as we seem to think, and the legitimacy of their government was questionable, and yet I'm to believe that a president could ignore all this and do nothing? It would have been a gross dereliction of duty, and because we know the costs of the war as no one did in the first year doesn't entitle us to help ourselves to rosy counterfactual scenarios for which there are no historical precedents. Mark, separatism was not, as a matter of historical fact, confined to the South. Or have you forgotten the Hartford Convention? However, I have to question just how much of a reality that was back then. Here's the rub: some 80-odd years earlier, Pat Henry declared in Congress assembled that "I am an American first, and a Virginian second." Historians of the American Civil War are often tempted to exaggerate the weakness of the Union before 1860. If the ties holding the various states together were fragile, it is easier to explain why the Union broke apart in the secession winter of 1860-61. Accordingly, historians often argue that state loyalties had always been stronger than national loyalties, that long-established differences between the states made a powerful central authority inappropriate and impossible, and that therefore the federal government had always been weak and inactive in the antebellum years. The story can then emphasize how the success of the federal forces in the Civil War finally established the principle that the Union was sacrosanct and perpetual, while the undoubted expansion of federal power during the conflict created central institutions such as the Union had never previously possessed. Thus an American nation, based on a true American nationalism, developed only after 1860, largely as a consequence of four years of bloody internecine strife between North and South. In this respect, at least, many modern Civil War historians would agree with the epic film maker D. W. Griffith: for them too, the events of the 1860s marked "The Birth of a Nation." This view is, however, fundamentally misleading. In the first place, it underestimates the strength of the Union between the 1770s and the 1820s. . . .
One thing to remember is how intense the slavery issue was in the period 1830-60. The country was locked in a bitter political struggle, and sectional tensions were at a boil for a long time, hard as that seems to grasp now. This period does not characterize the nation though, and thinking that it does is distorting. So Tony I highly recommend Ratcliffe's essay. Mark, I'm largely in agreement with your 9:37 PM comment. The idea that (for instance) Lincoln and other officers of the United States, regardless of the slavery question, could reasonably be expected to permit the Southern states to just walk away with the Lower Mississippi, thereby putting the farmlands of the Midwest at the mercy of a restive foreign power, is simply ludicrous. I know. My point was that Southern separatism from the North was quite intense in the runup to the CW. Paul, I'm one who likes to repeat a quote by Alexander Johnson. Namely, that "almost every state in the Union in turn declared its own 'sovereignty,' and denounced as almost treasonable similar declarations in other cases by other states". In other words, the South had no monopoly over claims of "States Rights," nor secession. I wish that were generally understood. So I don't think I'm forgetting anything. I wonder if you misunderstood my point earlier. The right of revolution is a natural (moral) right. The Founders, Lincoln, and everybody who was anybody thought so. But there is no right to secede, legal or moral. Secession is not a right, nor a power, let alone one delegated in any way. And this claim is rooted in what? I agree that the right of revolution was admitted by all parties. The question is, does this right of necessity imply a right exercisable only at the level of each individual man, with no intermediate power remaining as a legal authority, revolt overturning all political entities? Of course not. The secession of the colonies, using their very colonial political bodies to make it happen, proves otherwise. If the people choose to revolt against the federal government, there is nothing that REQUIRES that they also revolt against the state governments as well. When the people, for good reason, remove from a government its authority, they MAY take up that authority in their own hands for a short time before placing it in a new body, or they may directly and immediately transfer the prior authority into another (existing) body. The nature of political authority allows this. And as the colonial legislatures did, so also could the states do, of natural right. But more than this fundamental natural capacity: It remained true of the states in the federal union that they retained a legal capacity in this regard: they did not receive their origin or authority from the federal entity, and they retained their authority in all things not ceded to the federal government by the Constitution. Consequently, the Constitution established for the first time a multi-layer governmental system of SHARED SOVEREIGNTY - the states remained sovereign to the extent not granted to the federal power. By nature as well as by law, then, these state remained capable of exercising the powers and rights they had from their own founding (except those ceded). Since the Constitution does not take away from the states the right to secede from the federal union, the states retain that right. The South wasn't as unified as we seem to think, and the legitimacy of their government was questionable, and yet I'm to believe that a president could ignore all this and do nothing? might result from allowing states to exercise their statutory authority - to "enforce" the union in the face of legal act of secession was wrong. If the president thinks that a state governor is making a HUGE mistake in pardoning a murderer, the president cannot decide to negate the governor's authority in his own state and just send the army in to take over. The only authority the president has to act upon is the authority the Constitution gives him, and it doesn't give him the power to negate a state's action on its own powers and in its own sphere. The right to secede is certainly within the state's own powers. Likewise, if a policeman or judge thinks it is a terrible idea for me to punish my son by making him mow the lawn every day for a month, he has no right to step in and negate my authority within the family. The fact that I might indeed be making a bad judgment, and there might be some bad consequences, doesn't give them the authority to abrogate my authority with no law to back them up. Mark, I actually AGREE with you that the South should not have seceded, and that there would almost certainly have been some really bad long-term consequences from leaving the secession alone. There would have been constant and bloody internecine battle between the states within 20 years, going on for nobody knows how long but probably until a dictator emerged to unite them all by force. Not pretty. But that STILL didn't mean Lincoln had any authority to suppress the secession. The Constitution isn't a suicide pact. It also isn't a grant of "do whatever it takes" authority, either. Even more, referring to it being a "suicide pact" puts the shoe on the wrong foot: it wasn't on account of obeying the Constitutional requirements that the South was destroying the union, it was by reason of extra-Constitutional exercises of authority. Whatever else is the case, the Constitution is a pact that implies, about many if not most actions "if you are going to do something stupid, I cannot stop you." The Southerners were actually quite brutal to the Unionists in the South. There were brutal retaliations of Unionists in East Tennessee and other states, far more severe than actions by the Union against pro-secessionists. If Lincoln had actually negotiated with seceded states as he ought to have, he might have prevented or reduced some of these. What about an exchange program - we'll send you our Southern sympathizers if you send us your Northern sympathizers. But my point is not that there were clearly good alternatives here that would have solved all the problems. It is that you cannot do evil that good come of it, and this is what Lincoln seems to have fallen into. The war between the states had nothing to do with slavery. Lincoln was quite explicit on this point and made plain his indifference to the fate of the slaves. His entire purpose was the conquest and subjugation of the South. He naturally put it in rosier terms--'saving the union'--thereby arguing against all common sense that a union of two parties exists in spite of the wishes of either one of them. But it was a war of conquest. One might think it was a good or a bad conquest, but the reality cannot be denied. "So, who was more right: Henry, or Lee (both, ironically, patriots of Virginia)?" Tony, I don't think it's a matter of who was more right, so much as the point that both currents were active and had support up through the time of the war. That many folks did feel a stronger sense of loyalty toward their own state than toward the Union is beyond dispute. Whether that was the majority or minority view at the time is difficult to say, but it suffices that it was relatively common and widespread. Mark, you forget a couple things. First of all, if secession were allowed to occur there would be have been no obligation whatsoever for the North to observe fugitive slave laws any longer. The number of slaves fleeing north would have undoubtedly increased in this situation; hence, as Hummel points out, secession could have actually had an emancipatory effect over time. Secondly, Lincoln's contention that the republic would have to be either all slave or all free is ludicrous, and is an example of his overblown political rhetoric. The notion that there was a "slave power" seeking to expand slavery into all areas of the republic was a myth. This is not to say that there were not some Southerners who believed this. But the extreme pro-slavery rhetoric of some in the South was picked up on by the fledgling Republican party and used for political gain. The "house divided" analogy did not speak to the reality of the thing. If the Republicans were really all that keen on ending slavery there were other ways to go about it, given the fact that in all but one of every other country where it was eliminated, it was eliminated peacefully, and that cannot be blamed entirely on the South. To do so falls under Warren's "Treasury of Virtue" objection. Finally, if the Civil War was not an effort at aggrandizement of power by the Federal government, while are there liberal historians who not only admit the fact, but praise it? As I mentioned on the other thread, it has been said that the Civil War was the final battle between Hamilton and Jefferson, and that Hamilton won. If that isn't true why do both liberals and conservatives agree with it, the former praising it while the latter lament the fact? My thesis is simple: the Civil War, whatever else it did, instigated the birth of the American Leviathan, and all the debates about slavery, the Union, etc. are in a sense secondary to that fact. "It is that you cannot do evil that good come of it, and this is what Lincoln seems to have fallen into." In a very real sense Lincoln "needed" a war to consolidate his political support in the North. He seems to have believed that it would be short and sweet, lasting a few months at best. He was wrong, and his error cost over 600,000 lives. Tony, some minor points first. -The right of revolution does not apply to individuals, and I can't imagine why you think I implied this, or if not why you feel the need to tell me this. -Of course revolutions are not required of anyone. Again, quite obvious. For example, the American Revolution was not required. Doing nothing was a live option. But here is the rub. The problem is that we disagree on the this most basic of assumptions. A state becomes a state in virtue of joining the Union. Before that each was a territory or colony. We know the requirements for states because it was explicitly stated in writing (population and such,) and even then needed the approval of Congress for whatever reasons a given Congress might have. There was nothing impelling a territory to become a state if they did not wish it. How does that square with your view that a state's origin did not come from federal authority? There were a lot of good options and the only one you came up with is "we'll send you our Southern sympathizers if you send us your Northern sympathizers"? That is as radical a thing as I've ever heard. If this sort of thing ever worked there would be no wars. Do you have any reasonable options you could give as an example of reasonable options? There was all manner of negotiation for years, but they always foundered on the issue of the expansion of slavery. See the Crittendon Compromise for the last major one before Lincoln was elected. Slavery's elimination was never even contemplated because it was too radical and would cause war. Lincoln rejected the Crittendon Compromise, as did all Republicans, because they rejected the idea that slavery should expand. The Deep South seceded *before Lincoln took office* because they knew he opposed the expansion of slavery. He was not willing to negotiate that, and he was right not to do it. The South would only accept capitulation on this point, which wasn't politically possible even if Lincoln would have wanted to. He needed to consolidate his support in the North immediately after an election that occurred for the first time on the sole basis of strength of Northern support, the first time ever? That's a bizarre claim. Can you offer some evidence or reason for why you think this? Finally, if the Civil War was not an effort at aggrandizement of power by the Federal government, while are there liberal historians who not only admit the fact, but praise it? Rob, are you entirely averse to examples? And why did they disband the army after the CW? Why did they repeal the income tax after the war? There are strange acts if the intent was to increase federal power. What is it exactly that constituted this increase in federal power? The size and scope of the federal government after the war was a tiny fraction of what it became after the New Deal, or now. I think it is easily shown that the New Deal was the beginning of federal expansion into areas it had no business doing. This was compounded afterwards, but saying the CW was a grand dividing line with no evidence cited is the most vague slippery slope argument possible. Surely there is some metric available for what you are claiming. Federal departments, federal debt, or something? As I mentioned on the other thread, it has been said that the Civil War was the final battle between Hamilton and Jefferson, and that Hamilton won. If that isn't true why do both liberals and conservatives agree with it, the former praising it while the latter lament the fact? This is an absurd statement. It isn't right; it isn't even wrong. An emancipatory effect over time? As I said, more slaves escaping would invariably mean a vastly increased militarization in the South to contain them. Where's the "Whig History" complainers when you really need them? If the South seceded and then the sides fought a bloody war to the bitter end over whether slavery should be allowed to *expand* or not, why should we think if the South had been "allowed to secede" that they wouldn't have opposed the slaves leaving? Allowing to secede is what Northern folks then called "destroying the country." Besides which, if Lincoln had not fought the war he'd been impeached, or worse. No one thought they were electing him for the purpose of devolution. It was politically impossible for him to do because large majority of the Northern population would rather fight a war than let the country be dissolved. Arguing that the country would do just fine cut in half now is fairly presumptuous because since the majority of Northern folks then thought it was to destroy it. More "Whig HIstory." Things improve in time on their own automatically supposedly. And of course, we must ignore the fact that Davis knowingly ordered the most provocative and violent act in the Fort Sumpter drama, of the other options he had open to him. Which, to cut to the chase, brings us to the argument of how the devilishly clever Lincoln tricked Davis into firing on Fort Sumpter, otherwise known as initiating hostilities. He's turning over in his grave to have people imply he was that dumb. To add to what Mark (rather truculently, but nonetheless accurately) is arguing: we must bear in mind that strong elements in Congress (once the Southerners were gone) were pushing hard for a more ruthless suppression of the South. Lincoln had to handle the Committee on the Conduct of the War with some real delicacy. This was an age when the Legislative Branch wielded far more sustained and immediate power. The machinery was at hand (still is, for the most part, though it has long been quiescent) for Congress to subdue both the Executive and the Judiciary: an activated and attentive majority was a real force to reckon with. Senator Ben Wade could haul anyone he wanted before the bar of his Committee -- general, cabinet secretary, what-have-you -- and make him very uncomfortable indeed. Lincoln could do little to prevent it. All of which is to emphasize the historical anachronism of the sort of conjectures that would present Northern statesman as prepared to treat constitutional schemes they vigorously opposed with such respect as to endure the complete ruin of their own. That kind of detached forbearance in the face of crisis is not given to men here below. Sorry, gents, but I really am bowing out know. Mark, in my opinion you have made the reductionistic error of believing that since the conflict was primarily about slavery it was all about slavery. I believe otherwise. Fine so far. What is irksome is your implication that I am arguing in bad faith (I find that one gets this a lot when one is "heterodox" on Lincoln and the CW; sometimes it's not so implicit. This in itself is rather telling about the Northern 'Treasury of Virtue' mentality). In any case, that is something I do not have to countenance, and I will not engage further in this discussion, or in any discussion where my good faith is questioned. Mark has done a superb job of laying the neo-Confederate "let's all just get along, Union or not, Kumbaya" myth to rest. There was no way that secession could have resulted in peace. It was the position of the Confederacy that other states that had not seceded (Missouri, Kentucky, Maryland, and Delaware) had a right to join it. They also had their eye on territories in the West. Every election cycle in the border states would have seen strife in Missouri and Kentucky over whether to secede or not. It is difficult to see how either side could have avoided sending in troops to support its own side in those states. Secession equaled war, sooner or later. Lincoln realized this. Davis apparently realized this, or else he would not have fired on Ft. Sumter. On another topic, it is high hypocrisy to hear condemnations of Northern stereotypes of the South (Southerners are unredeemable racists, etc.) from neo-Confederates who treat everything "Yankee" with complete and utter contempt. That sectional hatred is a two-way street. On a last point, there is a persistent attempt on the part of neo-Confederates to defend the South as agrarian and to condemn the North as industrial. It should be remembered that the plantations of the South largely grew cash crops for export: cotton and tobacco mostly, but also rice, sugar cane, and indigo (at one time, anyway), etc. This was not subsistence farming for a local economy. It was intense, industrial-style, machine-enabled (Eli Whitney, anyone?) *capitalistic* farming. Part of the reason why the tariff was a big deal is precisely the fact that the South's economy was so dependent on trans-Atlantic trade (globalization, anyone?) with *industrial* Britain. Arguably it was the *Industrial Revolution* in Britain that made cotton plantations so *profitable* (capitalism, anyone?) in the Deep South. In fact, many Southerners thought that industrial Britain would side with the South because of "King Cotton." If the North envied this trade, it might have been because the Southerners were effectively "outsourcing" industry to Europe when there were domestic industrial labor markets at home. So muchy for the myth of the pre-industrial, agrarian South. Rather, to a large extent there was a market(capital)-oriented plantation economy that *depended,* very heavily, on foreign trade and global industrialization. While there obviously were yeoman farmers tending small plots in the South, it was *in the North* that agriculture conformed, by and large to the yeoman ideal. but here is the rub. The problem is that we disagree on the this most basic of assumptions. A state becomes a state in virtue of joining the Union. Before that each was a territory or colony. Mark, OK, so what do you mean by "state"? I was referring mainly to the classical meaning: an independent political order over a large-ish area, not obliged to obey any higher political authority in toto. See: "city-states" of Greece, and "nation-states" of Renaiscence formation. Each of the 13 former colonies were viewed as essentially independent states between the end of the War of Independence and the adoption of the Constitution, and the general view was that these independent states had the right to choose to enter into the new Constitutional order, or refrain and thus remain independent states. Their political integrity as independent entities pre-existed the United States, and by joining the United States formed an alliance of independent states such that they gave up elements of their sovereignty but NOT ALL of their sovereignty. (That's why the individual states retain their own secretary of state offices, by the way, and must rep). Each of these 13 states do not receive their authority from the Union, rather the Union received its authority from the states, and it only received PART of their sovereign authority. The very expression "United States" refers to the fact that before they chose to unite, they were already existing states that were not legally obligated to obey any higher political authority (except under treaty, and that refers to freely chosen obligations toward same-level entities). "State" is not a term that means, at root, " a member sub-entity of the national community of the United-States-of-America". It means something that exists politically separately from its political obligations to the United States. The federation was not a government of an undifferentiated national entity. It was a supra-government over separate, distinct partially subordinate entities. For contrast, see France's "Departments." We know the requirements for states because it was explicitly stated in writing (population and such,) and even then needed the approval of Congress for whatever reasons a given Congress might have. There was nothing impelling a territory to become a state if they did not wish it. Good grief. Is this the root of your thesis? Look, the United States, as a federal power, bought or otherwise acquired control of territories. These territories did not yet constitute any sort of political entity at all. Therefore the federal power administered them. When they acquired enough of the requirements to exercise political power decently, they had the potential to become separate political entities. The federal level rules about how they would become politically separate bodies kind of smashed two processes into one confused process: becoming positive political entities in their own right, and becoming member states of the US. That bi-fold act was integrated in part because it was assumed, rightly IMO, that the US as a conglomerate already owned the LAND, so it already had a vested interest in the political entities that sprang forth on that land. The new political entity did, in a sense receive the land itself from the US. Therefore, there was something implicit in their becoming state powers within the context of the federal union. Nevertheless, each time a territory became a state, it became a state with the same fundamental powers of self-rule that all the original 13 did. That means that is is viewed as being a partially sovereign political entity with rights and powers not received by grant from the federal power, rather the federal power remains a power over this new state precisely because the new state wills to become a member entity with the other states in the US aggregate, and thus wills to cede some elements of its sovereign authority to the federal government. The integral political authority of the new state as a new political entity comes from the people themselves who newly constitute a political community, not from the federal entity delegating power. All of this is made totally clear from the example of Texas, which really did operate as an independent entity for 10 years, and then elected to join the US union, and thereby came to hold (retain) just as much basic authority as each of the other states: sovereign in internal matters not ceded to the federal, subservient in other matters such as interstate welfare and foreign treaties. The right of revolution does not apply to individuals, and I can't imagine why you think I implied this, or if not why you feel the need to tell me this. The right of revolt belongs to members in a political community, because the political community is a community insofar as it is ordained to the common good of the individual men whose social natures make them political: the community derives its very being from individual men acting socially. I agree with you that no individual man, acting solely on his own without any consultation of his neighbors can start a political revolution to overthrow the government (though he can acting alone DEFY the government if it orders him to do something intrinsically wrong.) But if the government to be overthrown is the next immediate government directly over the individuals (say, that of a city-state of ancient Greece), when the citizens overthrow it, there is nothing left of political government obliging them to obey any human authority, until they place authority in a new entity. Without there being any human authority for that short time, each individual man is, as it were, acting individually rather than corporately, in working to find and agree upon the new authority. But if the overthrow is of the second (or higher) level government (say, not the city government but that of the county or state or federal), the men who have overthrown the higher level may do it in a manner that overthrows the intermediate level, or they may do it in such a way that they leave the intermediate intact. The colonies revolted against Britain not by overthrowing their own colonial home governments - they left these governments intact. ut there is no right to secede, legal or moral. Not true. The US has a right to remove itself from the UN and from NATO if it so chooses. In deciding to join the United States, Delaware could only lose its natural right to leave the union either by directly ceding its right away explicitly, or by wholly ceasing to retain its political integrity and becoming part of an undifferentiated national entity. Neither happened with the states adopting the Constitution. The Constitutional order is one of enumerated powers. All powers not granted to the federal stay with the states, and none of them gave up the right to secede. Nor did they lose their political integrity. Not true. The US has a right to remove itself from the UN and from NATO if it so chooses. In deciding to join the United States, Delaware could only lose its natural right to leave the union either by directly ceding its right away explicitly, or by wholly ceasing to retain its political integrity and becoming part of an undifferentiated national entity. Tony, it isn't really your position, is it, that the relationship between Delaware and the U.S. before the civil war was legally very much like the relationship of the U.S. and the UN? That seems to me very, very questionable. Mark, in my opinion you have made the reductionistic error of believing that since the conflict was primarily about slavery it was all about slavery. I believe otherwise. I have never said it was all about slavery, do not think this at all, and have stated otherwise quite clearly. Bonifacius: You make great points. The Northern Industrial / Southern Agrarian dichotomy is exaggerated to the point of fiction. You are right about the yeoman ideal, and my home state of Indiana was settled by poor farmers who wanted to get out of the class distinctions in the South and make a go of it in a new place where there was a more fair allocation of resources. They were "free-soilers," and that term is ubiquitous in literature of the time. One other point which I've not explicitly said, is that one can only speak of a "Northern view" or "Southern view" in broad generalities, though we often don't say this. For example, the view of a Northern Republican and a Northern Democrat were starkly different. If I speak of a "Northern view," I am only speaking in the broadest of generalities, and I think I am only entitled to do even this on the basis of how people voted in elections. Since Lincoln could not have started nor carried on the war without popular support, and since he did win elections when it mattered, I think it is a fair statement to say the North supported the war. This is not to say that large groups of Northerners didn't disagree with the war; they obviously did, but that it the case in any war. For these same reasons, when it comes to the South it is very dicey to say what the "Southern view" was. Much more difficult than today identifying those who we'd call neo-Confederate and such. How much popular support did Jefferson Davis have? It's something of a guess. Many Southerners hated him. How many? I don't know for sure because he never faced elections, nor thought he would as we can tell. We can speak of a "Southern view" that came to be long after the war in memory. But that was after those Southerners who disagreed with the narrative (otherwise known as Republicans) were driven out of the South or into voting as Democrats by intimidation, violence, and ostricizing. Just ask James Longstreet the price of becoming a Republican after the war. After all this, the novels and then movies "Birth of a Nation" (originally titled "The Clansman") and "Gone with the Wind" reflected and shaped a distinct Southern view that came after this, but that was decades later. So we can fairly speak in generalities of a "Southern view" after the war, but in the runup, during, and in the first years after the war it is very difficult to speak of a "Southern View" since they did not hold elections where disagreements are aired most reliably. They were "free-soilers," and that term is ubiquitous in literature of the time. I'd identified free-soilers with the whole Bleeding Kansas type of situation. I thought that a free-soiler was someone who helped to settle a territory in the explicit hopes that he would be helping to make it a non-slave state (a free state) later on. Are you using the term "free-soiler" in a different sense here, Mark? Tony, I see now we aren't using the term "state" in the same sense. I was referring to it in the American sense, the same sense that those who speak of "States Rights" used it at the time of the secession crisis. But even in the sense I see now you were speaking, what were the rules for the subparts of Greek or Renaissance city-states to secede without war? Each had their own culture, government, and structure. I don't see how transferring the problem to another culture solves anything. They had their own intramural wars over such things too. And I've always said that the South, as anyone, had the moral and natural right to revolution in any case. Lydia has put her finger on it. What is the nature of a political union? What is the sphere of sovereignty for the subparts of a union? Does a federal government have any obligations towards its citizens? Do the subparts of a state claim sovereignty over its citizens, or can they appeal to the federal government as citizens of the union? These are "in-principle questions" that are present in any context or culture. I am aware that Russell Kirk explored certain Calhounite understandings of political communities. I'm not clear on what extent he bought into this, but to the extent that he did I think he was mistaken. He may have just been learning about him and thinking out loud as he did. I know that in the depth of despair over New Deal politics one might cast about for any thin reed of hope from the past, but I think advocating gag rules forbidding debates in Congress, trying to censure and expel members of Congress over policy disagreements, advocating newspaper burnings instead of free presses, etc., is enough fruit of a person's political philosophy and character to look elsewhere. But at the end of the day, Calhoun only polluted the discussion of the central issues or what makes a polity and added nothing to it and only polluted it. Lydia, you may be right. I may have conflated "free-soiler" with "free-labor." I wouldn't have made the association you did with "free-soiler." I would have just thought it meant "opposing the extension of slavery" generally, but I could be entirely wrong. At least that was what the entire struggle was about between 1830-60. But I've not thought about the scope of the term before so I really don't know. No, Lydia, it isn't. It would be closer to say that the relationship between Delaware and the group of former colonies operating under the Articles of Confederation in 1786 was similar to that between the US and the UN. But even there, it is only "closer to", not quite the same. On June 21, 1788, the 9th of the 13 states ratified the Constitution, and then began the process of making the new government a going concern. But that new government did not apply to the remaining 4 at that time: VA, NY, NC, and RI. The new Congress was in place with a quorum in April 1989, by which time VA and NY had ratified. G Wash. had taken office April 30, 1789. But RI held out until May of 1790. Therefore, until May 1790, RI was not under the federal government of the United States. When it elected to ratify the Constitution, it chose to come under the federal government already then operating, by ceding to that government powers which naturally belonged to RI itself up to that point as an independent power. The same sort of thing happened with Texas: it was de jure an independent entity, and then became a not-independent entity by ceding some of its sovereignty but retaining its integral political being outside of the powers it ceded to the federal government. Through the war of independence and during the Articles of Confederation, the former colonies were in the betwixt and between stage of a developing but incomplete reality: the America of 1776 was enough of a unified community to choose to revolt en masse, but they were not enough of a community to have a single government that could (for example) tax people directly. They were still finishing up the process of becoming one nation. As a result, there was an anomaly of a disjoint between the de jure and the de facto situation. De jure, each former colony had its own government, and considered itself an independent state. De facto, each colony was not so independent that it wanted to be thoroughly and utterly independent of being able to call on the others for mutual defense (for example). As of legal right, any of the 13 could have refused to ratify the Constitution, and could have gone off on its own as a separate country. Morally, that would have been a bad thing to aim for and a failure to enact a legal framework that represented the de facto reality of unity that actually existed culturally, spiritually, etc. RI would have been morally wrong to, say, simply never take up the question of whether to ratify the Constitution, as if that were a mere option that they were utterly free to pass on without deigning to notice. They were morally obligated to at least take up the question. This is because America was, already, a moral reality to a large extent, though not yet complete. But they would not have been in any violation of the law of nations if they had done that: RI was an operating polity with de jure independence, and no legal obligation to remain in connection with the other 12 former colonies. The unique feature of America as Constituted is its formal incorporation of the principle of subsidiarity in the legal framework, making the whole a single nation without swallowing up and digesting the parts thereof. What is the nature of a political union? What is the sphere of sovereignty for the subparts of a union? Mark, those are indeed fundamental questions, but you have not posed them in the right manner: What is the nature of the United States union, and what is the sphere of sovereignty of the states in that union? Each national entity may have different answers to that question. In our case, the answer springs out of the fact that the federal government is a limited government of enumerated powers, with all non-ceded powers remaining to the states automatically. This federal government receives these ceded powers from the states, and has no other powers because it's nature is a derivative from the states themselves. Other countries may do it differently. Bonifacius, you do yourself no favors by jumping in this thread for the first time flinging around the term "neo-Confederate." As we can safely assume that you regard secession as treason, the charge you are hurling is right next door to "traitor." It so happens that you are addressing long-time commenters and even W4's newest Contributor; or, if you are not directly addressing them, you're being very sloppy in your rhetoric. As I am pretty much on your side as regards the substance of this debate, perhaps you'll take my warning to heart. So Tony, wd. your argument for the legality of secession be an argument from the 10th amendment, then, and the general concept of enumerated powers? I'm not learned in the history of this debate, but conceptually it would seem to me not entirely implausible that when the 10th amendment refers to other powers as being reserved to the states or the people it didn't mean to include secession, that being in a sense on a different plane, totaliter aliter. I'm something of a 10th amendment hawk, mind you, but I can at least see someone's not unreasonably saying, "Well, no, not secession. That's different. That wasn't one of the powers reserved to the states." Ok, I'll sit out until I learn some manners. Expect a long silence. "On another topic, it is high hypocrisy to hear condemnations of Northern stereotypes of the South (Southerners are unredeemable racists, etc.) from neo-Confederates who treat everything "Yankee" with complete and utter contempt. That sectional hatred is a two-way street." Here I was very sloppy indeed. I'm sorry, but I should have been clearer here. I don't even know if anyone in this thread said anything about Northerners/Yankees being evil. I was commenting about a general trend I see among people who defend the CSA, who support Southern secession today, and hence may fairly be called neo-Confederates. If you read threads over at "Chronicles," for instance, you'll see hair-raising accusations that make Yankees sound like Manichean demonic seed who lived and breathed to do evil. I'm sorry, but I actually wasn't addressing anyone here and I didn't see any of that sort of one-sidedness in *this* thread. So I accuse no one here of "high hypocrisy." As for my use of the term "neo-Confederate" regarding the notion of "peaceful secession," I apologize for the implication that those people are traitors who maintain that secession could have been peaceful. I admit to being strident, aka intransigent. I suppose this is partly because, as someone who has long read paleoconservative and traditionalist Catholic blogs and who once sympathized with secession, I feel that I was for a long time duped into mischaracterization of secession and the C.S.A. by people who were driven by prejudice and ideology and who withheld from me inconvenient facts like Alexander Stephens' "Cornerstone Speech." So I have some of the indignation and anger of someone who feels duped. Now, however, I must ask, what is the proper shorthand for "people who today defend Southern secession and the C.S.A."? Is "neo-Confederate" off-limits except for people who actively adopt the title and who promote Southern secession today? Even if the three positions I attacked (that secession could have been peacefully effected, that Yankee culture is innately corrupt, and that the South was better because it was agrarian) are positions held by people other than those who advocate secession, nonetheless these three positions are held by, well, people who would be characterized pretty well as neo-Confederates. IF I am permitted to hold that secession was treason, how am I not to use rhetoric (at least regarding *positions,* if not interlocutors) that reflects this? In a word, I would reserve the charge for someone who not merely evidences sympathy for the South or sympathy for regional loyalties, or even for states rights as such, but who positively embraces the secession policy of the Confederates, and in particular the fire-eaters who connived at disunion long before it actually happened. Bonifacius: Eloquently expressed. Cheers from the penalty box. I came to feel I was duped in many ways also. I revered RE Lee since 7th grade, and bought into the idea of Northern intransigence, corruption, and guilt over causing the war to a large degree. Read "Apostles of Disunion" by Charles B. Dew where he shares his painful realization that what he learned from his culture about the causes of the CW were plainly false, and that was after a grad school education to be a history professor! It was only after researching a book that he came to this realization. Lydia, the 10th amendment is important to my point, but not all on its own the sole telling point. Especially because the 10th is, after all, an amendment to the basic document. The conventioneers understood that what they were doing was putting together a legal order that respected the freedom of the individual states to rule themselves in most matters, but not in all matters. Incredibly, they came up with what is effectively a system of shared sovereignty, where the states remained basically what they had been before: sovereign entities in most matters. Another system would have allowed the national entity to simply swallow up the states, leaving them truly non-beings or empty shells with no reality but a facade. The method by which the senators were elected was an important contrast to the election of the House of Reps: the senators were elected by the state legislatures. And each state has the same number of representatives in the senate. As a result, the senate represented the _states_ as coherent political entities in their own right. Ultimately, the federal government is a government that shares sovereignty with the states. Like an alliance of independent states (such as the UN), the federal Congress has representation that represents the states themselves. Like direct republic, the federal Congress has representatives elected directly by the people. Thus the Congress was built to keep the federal authority in check by enabling the states to keep state power in the states. Subsidiarity written right into the framework. Although the 10th amendment helps clarify, it would be arguable that the intent of the Constitution was to leave the states their powers anyway. As it is, with the 10th, it is absolutely clear that the only powers the federal has are the powers it receives from the states, and those are enumerated rather than general. The holder of GENERAL powers of government is the state. Whatever is lawful for a state to do on its own general authority, is lawful for a state to do after joining the union (unless explicitly precluded), because that's the nature of the Constitutional order. I can at least see someone's not unreasonably saying, "Well, no, not secession. That's different. That wasn't one of the powers reserved to the states." I agree that there is something unusual about the right to secede. But I think the difference is a moral one, not primarily a legal one. Just as all of the former colonies were effectively becoming bound up in the new nation of America in the 1770s and 1780s, and for that reason it would have been wrong for Rhode Island to refuse to at least consider whether to join the union, so also today all of the states are really and truly (spiritually, culturally, morally) part of the union. You do not choose to walk away from a union of this nature but for the most grave and necessary reasons. But such is not impossible. The South claimed that the North and the South had grown so apart in culture that they no longer ought to belong to the same polity. But the most important difference was, of course, slavery, and the South had no moral leg to stand on in holding fast to this difference. They should have eradicated slavery themselves during the 1st half of the 19th century, and had become moral midgets in claiming a right to maintain it. If the differences between the North and South had really been wide enough, and of such a nature as to permit the South to be right to maintain and pursue those differences, it could possibly have been moral for the South to leave off being bound up with the North in a similar way that it became moral for the colonies to leave Britain. That earlier event was a form of revolution, because the colonies' governments themselves had at least in some sense received their powers via grants from Britain. But as revolutions go, it was less a revolution than a secession: the Americans did not try or want to overthrow the British crown, or the British way of governing. They were perfectly fine with leaving the British government intact - for the British. The condition was different for the states vs union in 1861 primarily in this respect: the only reason the federal government has any powers is because it receives them from the states. Therefore, it is not quite in the nature of the same sort of upset for a state to secede from the union. It would be the breaking apart of political bonds (like happened in 1776), but presumably this would not be undertaken (rightly, morally, that is) unless the peoples had become no longer bound as well in other basic respects. It would also require, for morality, a method or process that, as anticipated, would not result in so much damage and hatred as to outweigh the good hoped for in dissolving such bonds. But still, since the states are formally the underlying source of the federal power, it is essentially not revolution for the states to reverse that grant. But even if you insist on calling it revolution rather than secession, the states most certainly had that right, as do all people retain the right, to throw out a tyranny and install a new government. The founding of America used that principle in very nearly the same manner the Southern states attempted. In form, at least, the southern states had the authority to reject the overlordship of a tyrannical government by revolting against it and forming a new order. It so happens that they were wrong to do so, but not because they did so in the form of secession. Don't get bound up in a game of semantics: whether you call it revolution or secession, the states as political entities had the right to sever their bonds with the union. Let me be perfectly clear: no state had the inherent moral right to secede for petty, temporary, or minor reasons. The right of secession was part and parcel of the right to re-align the governing authority under a new form, and THAT power should never be invoked but for grave reasons. Unlike a contract that you have with a commercial party, which you are free to renew or not renew as befits your personal preference, your whims, or your personal welfare without direct regard for the other party's benefit, forming part of a political union (rather than a contract or mere treaty) has serious long-lasting consequences that create limits on right action. The union was not merely a treaty of equal parties that remained wholly sovereign entities: they ceded some of their sovereignty. The union was an open-ended (i.e. without any determinate terminus in duration) binding commitment. Unlike a Christian marriage, however, this commitment was capable of being severed under extreme conditions. So my answer, Lydia, is this: since the GENERAL political authority remained in the hands of the states, does this general power of its own nature include the right to dissolve a previously existing bond given the right conditions? Yes, as proven in 1776. And the conventioneers so understood it to include that. That's the inherent nature of an establishment of an enduring (no definite terminus) political bond: no earlier people has more authority than a later people, and so cannot bind the later people to a form of government that has become gravely unjust and looks to remain so indefinitely. Thanks for the detailed reply, Tony. I'll have to reflect on it. My own nit-picky, quasi-legal brain has trouble thinking that it doesn't matter whether one calls it "revolution" or "secession." For one thing, secession would be the secession of states, period. It's not as though some non-state body could secede from the union. And the legal and moral arguments there, as your own discussion shows, center on the questions of state sovereignty and on the senses in which it was or was not given up at the forming of the union. The arguments for and the nature of revolution seem much different to me. It would seem to me, for example, that a single _town_ could form at least the center of a revolution. Even if we're a bit fuzzy about exactly how many people it takes to start a "legitimate" revolution, it at least does not have any _strong_ connection, either logically, legally, or morally, to states as governing entities per se. It might have a practical connection, but that would be all. If I knew more about the American Revolution, I could probably defend this better, but my perception is that even there there were people who decided to side with the colonists qua individuals or small groups, rather than its being tied only to whole colonies in the way that secession at the time of the Civil War was tied directly to states. So it seems to me that it does matter. The justifications will be different depending on whether one views oneself as joining a revolution or as being part of a rightly seceding state. In fact, I could imagine that even someone who thought his state was _wrongly_ seceding might still consider himself bound to fight for it, whereas that would not be the case if he thought that some non-state group of people was wrongly starting a revolution. Paul, I didn't think Bonifacius was referring to me in calling out neo-Confederates, because it is so obvious that I think the Confederate cause was wrong. I don't think they should have seceded, and I think Gen. B was an idiot for firing on Ft. Sumter. Bonifacius, it is possible to support secession in theory without supporting the South's secession. Also, it is possible to support unequal forms of rights and privileges (and duties and obligations) in society without supporting chattel slavery (see, for example, feudalism, although I don't really have much use for feudalism). Finally, it is possible to support the idea of a fundamentally important role of land-based cultural agrarian institutions in keeping the polity wholesome, without claiming that the South was an agrarian utopia. (I am not an agrarian myself, I am just pointing out the theoretical possibilities). Some of the people here are actually multi-faceted and cannot really be put in one square or round hole readily. At this blog, we try to make distinctions rather than get heavily involved in name-calling, especially name-calling that might overlook distinctions. There is plenty of name-calling at other sites. We encourage a temperate attitude that looks for the truth more than scoring points (although I have fallen down on the job on occasion myself). since the GENERAL political authority remained in the hands of the states, does this general power of its own nature include the right to dissolve a previously existing bond given the right conditions? Yes, as proven in 1776. There is a natural (moral) right to revolution. There is no natural right to an *uncontested* revolution, nor could there be. Are you saying that the Brits were morally wrong to contest American independence? What was proved in 1776 is that force is required to make the right effective. The CW reaffirmed this. In other words, the South (as anyone) had a natural right to revolution, but this does not imply the North was morally bound to accept this. In my view, they would have been morally bound to accept it if the South had been a distinct people. The claims of Southern distinctiveness, though real as any other region, are greatly exaggerated. The reason slavery comes up so much is because in the four-year attempt to craft a distinct political identity, a requirement for a successful revolution, slavery was the only thing that Southerners ever came up with that distinguished it from the North. This was the genesis of Stephen's "Cornerstone speech," deeply embarrassing as it is now. The war wasn't lost on purely military terms. The fact is that Southerners did not craft a distinct political identity, and they also knew that no horrible fate awaited them except the abolition of slavery if they lost. The attempt to forge a distinct cultural identity failed, and their quick reintegration with the nation showed. Mark's point helps me to focus my instinctive thoughts about the difference between revolution and secession. If secession was _legal_, if the states really had retained the legal power under the Constitution to secede, then the North was bound as a legal matter to let them secede uncontested. If the people of the south were engaging in a revolution, then there was no such legal requirement on the federal government to "let them go in peace." So one's evaluation of the actions of the North turns pretty crucially on whether one thinks secession was a right retained under the Constitution and on whether one evaluates the secession of the southern states as revolution or as orderly and legal secession. If the people of the south were engaging in a revolution, then there was no such legal requirement on the federal government to "let them go in peace." Lydia, if a people uprightly determine that they must engage in a turning away from a prior political bond, and that this act is moral - nay , that morality requires it - as did Americans in 1776, then by that fact the other party cannot be morally obliged to contest it. It cannot both be true that God wants A to depart from B and wants B to fight A over the matter. (Now that I think about it, Pakistan and India in late 1940s probably presents an example: because of internal friction, the two groups needed to become separate, and distinct countries were formed for the sake of peace. The fact that the two then ended up at each other's throats in full war cannot be a logically necessary moral requirement following on the political decision to separate.) So for secession or for revolution, no more than one opposed party can be right about whether leaving was right, and in either type of departure, if the departing body is in the right, a so-called "legal" right of the other body to contest the issue is misplaced because there is no moral right to contest it. On the other hand, there would rarely be a situation where A needs to depart but for the fact that B fails to see and grant A the room it needs for some sort of different way of doing things, while remaining within the union. As a consequence, A should never expect that choosing to depart will be accomplished in peace, and therefore (with all the more reason) choosing to depart is such a grave matter as to require the most definitive justification. The status quo always holds presumptive right against which there must be definitive showing of just cause. What was proved in 1776 is that force is required to make the right effective. Mark, you are right that there is a moral right to a revolution. But the normal meaning of "revolution" is to overthrow the government and form a new one. This is not what we did in 1776, at least not simply. And if we were morally obliged to depart for the sake of the common good, then Britain was, objectively, wrong to contest this. But there was a distinction between conditions with the colonies in 1776 and the states in 1861: the colonial governments had received their form and their power, in part, at the grant of the British monarch. Legally, then, the colonial governments were at least in part dependent on the British government for their authority. In order to depart, the American colonies had to overturn that dependency, to become legally separated meant to dissolve a bond that was legally structured in dependence on the crown. They had to overturn that legal structure. No such situation applied to Georgia in 1861: nothing about Georgia's state government was formed as legal dependency upon the federal government, quite the reverse. Therefore, there is lacking the similarity with the colonies in breaking the bonds: the states that joined the federal entity did so by a free choice, exercising a specific form of authority - that of reformulating its own governmental relationships with other bodies. That choice did not dissolve Georgia as an integral political body. It did not cede all of Georgia's authority, nor all of Georgia's sovereignty. The Georgia government remained the holder of the state's general political authority. Since the Constitution only gives the federal authority enumerated powers, and nothing about the Constitution provides that the member states thereby become states in dependence upon the federal union, nor dissolve their inherent political integrity, nor explicitly grants to the federal the right to prevent a state from leaving, it cannot but be the case that the power with which Georgia joined the union remains with Georgia. It therefore remains with Georgia to cease to be a member. Legally speaking, no federal authority can point to a provision of the Constitution and say: "secession is against X provision, and we hereby make your secession null and void as provided in X.1." But the only powers the federal authority has are those enumerated. I think that it was wrong for Georgia to secede, but not because it is inherently wrong for a state to secede. It is unlikely that any state ever will secede in peace, but that merely means that unjust wars are fought over secession as well as over other matters. You cannot claim that God wants wars to be fought over secession even when secession (or revolution) is precisely the correct step for the common good. So for secession or for revolution, no more than one opposed party can be right about whether leaving was right, and in either type of departure, if the departing body is in the right, a so-called "legal" right of the other body to contest the issue is misplaced because there is no moral right to contest it. But a legal obligation _not_ to contest it, a legal lack of authority to contest it, might apply even if the group leaving was doing something unwise, unnecessary, and for insufficient reason. This is clearly true on the individual level: Person A belongs to some group or club that has a lot of internal cohesion and that is doing good work. Person A gets into a temper over some trivial matter and leaves the group unwisely. This is wrong of A, but the rest of the group has no authority to force A to come to the meetings. The group was from the beginning a voluntary association of what we might call legally sovereign entities, and it's not within their proper sphere to force anyone to remain in the group. Now, similarly, _if_ the United States was the type of union in which member states retained the legal prerogative to leave, it would have been wrong of the federal government to oppose secession even if the southern states left for insufficient reason, because it would have been outside the federal government's proper sphere of authority. That just wouldn't have been the place of the federal government, and the federal government should have understood that all along, just as the UN should understand it all along. That's a very different reason from any sort of argument that even _can_ be made about a revolution. There, it seems to me, the entire issue comes down to who is in the right about the reasons for the revolution itself. Lydia hits the nail on the head for why claiming a legal right to secession is required to say the North's effort to end the insurrection was unjust. This is the crux of the matter. This is the crux of the Northern culpability thesis. Merely upholding the moral right to revolution does not make the North guilty of any wrongdoing, and that is what so many wish to hold. No such situation applied to Georgia in 1861: nothing about Georgia's state government was formed as legal dependency upon the federal government, quite the reverse. Therefore, there is lacking the similarity with the colonies in breaking the bonds: the states that joined the federal entity did so by a free choice, exercising a specific form of authority - that of reformulating its own governmental relationships with other bodies. But Tony, Georgia was an original Colony, as were two others. The other eight seceding states were approved as an act of Congress, based on a number of requirements and all the whims of Congress that we know and love. That is why for decades states were brought in free/slave state pairs to keep it even. My home state of Indiana was brought in only because the Southern block insisted Mississippi be brought in as a slave state. Anyway, how is it justified to form a theory of the sovereingty of statehood from the cases of the original Colonies? I don't believe there was any moral obligation to revolt from the British crown. It was a free choice. I think they were morally justified to revolt, but they were just as morally justified to submit the British rule. On what basis were they morally required to revolt? I am not persuaded that the British were brutal to the Americans. I am not saying you are doing this in any way, but one of the problems in how people think about the Revolution is that they see it through the screen of Just War Theory. But I think it is highly problematic to try to apply JWT to modern wars of independence except for treatment of non-combatants and other important generalities. But casus belli in a war of independence? I think it is an absurdity. Again, I'm not addressing anything you've said here. But it relates to your comment that "It cannot both be true that God wants A to depart from B and wants B to fight A over the matter." This is the crux of the matter in your argument that the North's war was "morally wrong." It is a huge point of disagreement. I think this manner amounts to viewing ethics in the fashion of a decision tree, where conflicts are not seen in all there complexity. But God didn't make the world that way. This is a basic disagreement over the nature of reality. Why did God make the world in such a way that moral contests were unavoidable? It also happens that some of the most enduring of Lincoln's public speeches involved just such realism in his remarks about which side God was on in the contest. His poetic answer of something like "both, and neither" gets at the truth of the matter. In my view, the moral fact of the union itself lends a heavy weight against a kind of exercise of secession that is simply a pure whim on the part of a state to go it alone. However, the construction of the union as a union of states wherein the states retain their integrity lends a heavy weight toward at least the theoretical possibility of secession. This theoretical possibility becomes stronger still when viewing the 10th amendment. Again, it is not conclusive in an explicit sense - the amendment does not speak to anything like secession, does not even come close. But the very basis for the amendment's general terminology was to leave to the states the unforeseen and as yet indeterminate powers that may be needed for the future, it was no business of their to circumscribe the limits of the states' powers by the at-that-time known needs. Anything that was not thought of explicitly for the Constitution and granted to the federal might fall under that. There are clearly worries for the union in admitting the states have a right of secession, and as a result the union government would have a vested interest in claiming no such right. And some of these worries are real enough: without stability, the union cannot make enduring commitments. But there is more than one sense of endurance that is possible. One form is a sort of absolute bond that can never be broken no matter what. Christians receive this bond by baptism, which cannot be repeated precisely because it is utterly unbreakable. Another form is an endurance that belongs to marriage: it continues till one or the other dies, then the other is free to remarry. This is clearly not any sort of absolute permanence, but it is obviously sufficient for any married couple to take on tasks and commitments for the future that assume an enduring nature, such as rearing children, a task that takes 20 years minimum and may take 40 years to raise a whole brood. How many governmental tasks take 40 years to bring to fruition? Still another form of endurance is one of a perpetuity that remains in force until some condition occurs, an endurance without any distinct end at all (unless the condition must of necessity occur eventually). This last is capable of being far more long-lasting than marriage, given the right condition. Nation forming clearly has nothing to do with absolute permanence - nations eventually come and go. It ought to be much more long-lasting than any marriage. And it is sufficient, for virtually all purposes, for it to remain in being until member states of the nation have grown so thoroughly apart that they need a separate government to accommodate the common good in their respect. There is nothing in the nature of the Constitution to prevent an abused and provoked state from (a) deciding it wants to go it alone, and then (b) seeking the peaceful consent of the union itself to that proposed departure (imagine Hawaii for example). This bilateral act would be a secession without any form of revolution at all, or even any disputed legal issue. And if the union gave its consent, no part of this process could be called a violation of the unitive purpose, or effectuating the "dissolution" of the union as such. Thus, the mere fact of a departure of a state is not in itself a grave violation of the common good for which the union exists, nor an injury to the very principle of the act which joining the union constituted: the act has the potential of being reversed. And since that which was not Constitutionally proscribed to the states was (inchoately) assumed to remain possible to the states, there is no way to prove that the states could not depart legally under any circumstances whatsoever. Therefore, it cannot really be argued that from the very beginning it was certainly (though implicitly) understood that departure was impossible, that mere possibility of departure would destroy the very meaning of union, and that the right of departure was one of the things being given up. But of course, if a part of the state's grievances include the impossibility of getting the union government taking it seriously, then this above form of solution would be impracticable at best, and injurious typically. How, then, could a state in this condition fulfill its fundamental needs and rights? If it secedes unilaterally (without seeking consent of the union) it must needs do so by reason of a power it retained of its own capacity belonging to it irrespective of its joining the union. If the state had the authority to decide to join the union or not to join the union, then it (originally) had the power needed. The question is, did it give up that unilateral power in joining? There would be a good case for that if the Constitution said anything about the matter, but without saying anything, and with the 10th amendment, there is an insurmountable obstacle to proving that it DOESN'T retain that power. Summary: the union and all its political arrangements could have been exactly the same as they were actually laid out, had the Constitution explicitly provided for unilateral secession. The Constitution provided an interpretive rule to its meaning with respect to powers not mentioned: they remain to the states. The power to unilaterally secede was not mentioned. It cannot be proven that this was a power intended to be forsaken by the states when joining. All a state (especially one joining 150 years later) needs to say is: we intended everything in the document, and nothing else. The document leaves our inherent unilateral right intact. Okay, but by that argument the union was wrong to prevent them irrespective of whether the states' reasons really were good ones or not. Which is quite different from the rationale for blaming the union if the south's move is conceived as a revolution. The rationale in the latter case would have to be substantive, something like, "The grievances of the south really were so great that the states were right to secede. The people of 1789 had no right to bind the people of 1861 to live under tyranny. The federal government was exercising or was about to exercise tyranny. Therefore, the union was wrong to stop them." Which is a much harder sell. My limited point, then, is simply that it does make quite a big difference whether one conceives of the south's move as a revolution or as secession. But Tony, as I've already said, the problem of disunion as secession is not a problem unique to the American context. Has there ever been a nation anywhere at anytime that specified in any way how to secede? A national divorce clause? I think not, and surely this cannot be ignored. Divorces is allowed because a higher recognized authority exists that both parties are bound to respect. Sovereign states do not have this by definition. If no national secession clause can be found anywhere, wouldn't that be why? If so, wouldn't that be strong evidence that we're dealing with an "in-principle" problem here, as I've argued? Put another way, the only valid divorce clause for a sovereign state *is* the right to revolution. This is why no requirements for revolution can be given. There are no rules except the rules of war. -I don't think the South's grievances were legitimate. -Lincoln and others fully believed in and respected a natural right of revolution, but they were wise to note the significance to the fact that the South seceded immediately after an election. This is absolutely huge clue to whether this was a revolution or not, and no reasonable person should or could ignore this. "Words are wise men's counters, they do but reckon by them: But they are the money of fools . . ."
For these reasons, I do think it was an insurrection rather than a revolution. But I give them the benefit of the doubt for the sake of argument and call it a revolution, since I think that is a natural right. That way I can separate the important issues we're discussing from the arguments about whether the grievances were legitimate, which is a separate issue. I was thinking that an interesting analogy to the Civil War would be the difference between contested versus no fault divorce. The South said, "You are trying to change me, I will not be changed," and demanded an uncontested divorce, even while they tried to seduce the other territories to their side. The North said, "Over my dead body." The war itself was the bloody court case, a "trial" of arms. Step2: I think that is pretty much it, except perhaps to add that the world was changing. But anyway, many after the war, Unionists at least, did express it in similar terms. Grant said afterwards that the end of slavery was accepted by both sides because the matter had been settled by "the highest tribunal available to mankind . . . the force of arms." Which will probably lead someone to ask "Does that mean might makes right?" Of course the answer is no. Has there ever been a nation anywhere at anytime that specified in any way how to secede? A national divorce clause? I think not, and surely this cannot be ignored. But Mark, no ever nation had ever attempted the unique American experiment: a system of shared sovereignty, that the overarching authority had a limited sovereignty, and the "lower" authority had "all the rest". Where the higher body came to be by a grant of authority from the lower entities, in an act of enumerated powers. I am not quite sure that any other country has quite tried that as we have. Though I suspect some may have attempted something similar, it requires (to emulate us) prior existing bodies that rightly hold independent authority. I am not sure Canada or Australia can be said to have this. Are there even any other possibles running around? So, it is not surprising that there are no other examples of a separation mechanism. Okay, but by that argument the union was wrong to prevent them irrespective of whether the states' reasons really were good ones or not. Lydia, that was my conclusion. Unfortunately, because the South's reasons really were bad. And would have been equally bad posed as a revolution, but the legal implications would have been different: then the North would have a good reason to oppose the revolution. But Mark, no ever nation had ever attempted the unique American experiment: a system of shared sovereignty, that the overarching authority had a limited sovereignty, and the "lower" authority had "all the rest". Where the higher body came to be by a grant of authority from the lower entities, in an act of enumerated powers. I am not quite sure that any other country has quite tried that as we have. I think that is an idiosyncratic interpretation of American exceptionalism as far as anything that would bear on the question of whether it was morally wrong for the North to wage war to bring the seceded states back into the Union. I think it just begs the question. We can't just assume there is some exceptional quality that makes your assertion true. I understand that you have given arguments to this effect too, but I don't find them persuasive. Ultimately, I think the crux of the matter is whether or not your statement is true: "It cannot both be true that God wants A to depart from B and wants B to fight A over the matter." I'm not aware of any theological view with any standing that would support this, and I think this flies in the face of the common sense understanding that accepts what you're rejecting. Interestingly, I think support for this common-sense view has been expressed memorably by Lincoln in one of the most interesting speeches in American history. So unless we want to argue this fundamental point specifically and directly, I think we'll just have to agree to disagree. (1) The federal powers came arose out of the plenary state powers which preceded them. (2) The individual states were not obliged by the law of nations to join the federal union. That is, there was no human law or treaty obligation that required them to join. (3) The compact was one of enumerated powers for the federal union, not for the states. (4) The compact left those powers not enumerated to the states. The only issue that is really in debate is whether the act of joining the union was an act by which the state gave up (implicitly, since all admit that nothing explicit speaks to it) the power to un-do the joining acting with its own legally retained powers. This is reasonably debated. Ultimately, I think the crux of the matter is whether or not your statement is true: "It cannot both be true that God wants A to depart from B and wants B to fight A over the matter." Of course there is some extended sense of God's willing by which one can say that God wills A to depart and B to fight over the matter. That extended sense is that of God's permissive will, I think: God permits men to do evil, because He plans to bring some good out of that evil. But there is also a primary sense in which God does NOT WILL such a war: in each war, at least one side (sometimes both) is in the wrong to think they ought to fight the war and does something immoral by going to war, and God does not will the side in the wrong to do moral wrong. It is impossible that just cause be found on both sides, (except by a vast and severe hiding of basic facts from at least one side). That's my read on the theology, I would welcome being corrected if I have misjudged the matter. I find it very puzzling that you cite Lincoln's second inaugural address by way of disputing me: after reading it again, I fail to find more than one single point with which to even remotely disagree. It just doesn't speak to the issues here. Lincoln was going out of his way to be non-controversial. And he succeeded. With the exception of that one clause, every Southerner who disliked slavery (no matter how rabidly states' rights he was) would have agreed with the entire speech. I find it MUCH MORE agreeable to common sense that if a state left the union either in a act lawful in light of its retained powers (if there were such retained powers hypothetically) as well as moral in light of its repressed plight, OR left in a morally upright act of revolution, by these very facts it means that God does not want the union to pursue the state with war. That you think common sense indicates otherwise has me totally baffled. God WANTS them to go to war when war is unnecessary by one side admitting the other side has the right? By the way, did I mention that I think the South was ALSO wrong for starting the fighting themselves? Tony, here's what I don't get. I thought you'd said the North was legally justified in waging war to get the seceded states back in the Union, but not morally justified. But it seems to me your Constitutional line of argumentation implies that you don't think it was legally justified. I just don't get that and we're at an impasse. I didn't cite Lincoln's second inaugural "by way of disputing" you. I only used it as an example of what I think is a common sense understanding of moral issues over conflicts when considering it from both sides as we are. But here especially there is only so much arguing you can do about disputes over basic theological and/or philosophical assumptions. I get that. But this is a technical debate among friends, not a game among rivals over regional loyalties ideologically, or any other regional aspect, so it matters not at all. If I wanted to speculate on motivations for why some simply cannot even entertain the idea that the war to reverse secession was morally justified, it wouldn't have anything to do with regional issues, and certainly not any moral issues related to anything like slavery. In my view the main underlying issues in a crowd like ours come down to one of a) the same type of theological/philosophical dispute we'd have in the "is it ever permissible to lie" debate; b) a social/political dispute over how Americans of a certain ideological lineage see the nation, or some combination thereof. The latter was hinted at by Rob when he floated the Parringtonian thesis of a Jeffersonian/Hamiltonian Manichaean view of American history. But I think that thesis was fairly bizarre to begin with, and in any case I think has had no real currency now. In fact, I think it is fair to say Parrington has been effectively eliminated as an element in the interpretive debate about the nation since WWII. If I were speculating on motive, it would be along the lines of an affinity with a detached Tocquevillian self-understanding of the nation that is rife in academia, and mostly unreflective. For example, we see this frequently in denunciations of American "individualism" (as well as consumerism, materialism, etc. ), that amount to an argument that an individualism that is alienated and reactive is superior to one that is accepting and participating. These are the sorts of underlying assumptions that no one talks about, which probably mean that is where the action is. I didn't list a book on Henry Adams and also "The Genteel Tradition and the Sacred Rage" in my CW book list for nothing. The Constitution provides no mechanism by which the federal government can prevent a state from peacefully seceding. After all, the only mention it has about emergency powers is to suspend the Writ of Habeas Corpus during a time of insurrection or invasion. Insurrections are violent in nature. The secession of every state was peaceful. The federal government was not justified in the legal sense here. However, South Carolina's mindless attack on Fort Sumter gave the federal government a legitimate casus belli. From that point on, the federal government's annexation of the Confederacy was as legitimate as our annexation of half of Mexico. The right of conquest is still legitimate. Americans on both sides should be glad of the fact that despite his numerous problems, Lincoln was prudent in demanding a return to most of the status quo antebellum for the South. Had the radicals gotten there way, a second civil war would have been inevitable and given the population and industrial growth of the South in the 20th century, would have been horrifically damaging to the North. 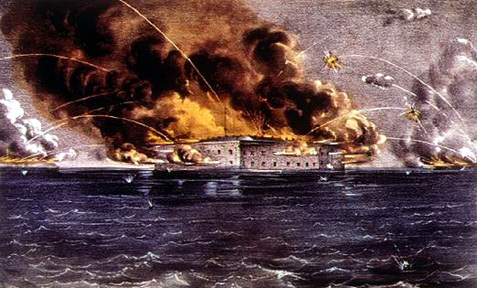 However, South Carolina's mindless attack on Fort Sumter gave the federal government a legitimate casus belli. Mike, that's my thought also. They were idiots to give the North a specific place to hang their hat and say: "they started it, but we'll darn well finish it." From that point on, the federal government's annexation of the Confederacy was as legitimate as our annexation of half of Mexico. The right of conquest is still legitimate. The right of conquest is legitimate, in its proper place, limited by tons of conditions. One of them has to be related to the casus belli, I should think. "If I wanted to speculate on motivations for why some simply cannot even entertain the idea that the war to reverse secession was morally justified, it wouldn't have anything to do with regional issues, and certainly not any moral issues related to anything like slavery." I do not want to jump back into the fray, but it might be instructive to look at the various groups which are critical of the Federal effort to maintain the Union by force, and determine what they have in common. You have some fairly odd bedfellows here, but there is a common thread which runs through them all despite the differences: a suspicion of and resistance to federal government centralization/aggrandizement of power. The question then arises, why then are there many folks who despite being suspicious of and resistant to state power, accept the idea that it was valid to use force to maintain the Union? The possible answers would seem to be either that they don't know/don't believe that the Civil War entailed a federal accumulation of power, or that they know it, but believe that the preservation of the Union was worth the trade-off. This is, of course, an overly simplistic analysis, but I think that it catches the gist of the thing in a nutshell. They thought they could win a war, and they almost did. It is only idiotic if you think they never had a chance to win the war, which is the Shelby Foote narrative. I like Foote, but I think it can easily be shown he was wrong about that. The truth is without an astonishing amount of determination from the North the South would have won. The British observers were astonished when they saw the unity and determination of the Northern public to carry it through to the bitter end in the Overland Campaign. The South came within a couple of months of winning it by holding out until the election, which Lincoln would have certainly lost without some major victories. I agree with Mike and Tony. It doesn't take anything away from Mike's point to mention the peculiarities of the Mexican war. It was widely viewed by the free-labor and free-soil constituents as an expansionist power grab by a Southern president (Polk) who ginned up a cause to extend slavery. Lincoln denounced this war at the time in blistering terms with a series of resolutions in Congress, which may have contributed to the loss of his seat in the next election. John Quincy Adams, Henry Thoreau (refused to pay the state poll tax and spent a night in jail over this), and many other public figures were vehemently opposed. U. S. Grant stated baldly in his memoirs that the Mexican war caused the Civil War. For these reasons there was little support for the war in places like New England, which was mindful that annexation of TX would mean another slave state and likely other future new slave states. The war was a war fought with comparatively few US troops (~100,000), and inspired and daring leadership was used to defeat the larger Mexican forces because of their uninspired leadership couldn't make sufficient use of the bravery of their individual soldiers. If these few troops had not subdued the Mexican army in this unconventional way, it is likely that the war effort would have collapsed due to lack of public support. Of course, there was no way the 19th century Mexican government could actively administer that vast territory, so the idea that it was "stolen" from them doesn't hold water. A government has to exercise certain responsibilities to the citizens of a territory to command their allegiance and the Mexican government couldn't do that. Well why don't you do it? If you were to actually do this, you'd find there are odd bedfellows on both sides of the divide you've setup in this Paleo-Libertarian fantasy. You'd find that the Paleo-Libertarians are aligned with a good number of Leftists. Moreover, you'd find that your side would NOT be on the side of the Reagan Republicans, nor the Reagan democrats. Oops. Paleo-Libertarians of your stripe are not the center you imagine. Even more interesting would be a comparison of the sides who support the New Deal policies today. There you'd find a much higher affinity of like-minded groups on the Conservative/Liberal plane. There you wouldn't find that many strange-bedfellows on either side. What does that tell you about the validity of your thesis? Dude, why the aggression? I didn't propose a thesis, I made an observation. And who said anything about my views being the "center"? Certainly not me. And for the record, I'm neither a paleo nor a libertarian. I'm a Kirk/Weaver conservative with a distributist/agrarian streak. As such it's entirely possible that I have some things in common with the decentralist Left. And? I don't understand your second paragraph at all. I know of very few conservatives who are keen on the New Deal. So what's your point? "a study of the "various groups which are critical of the Federal effort to maintain the Union by force, and determine what they have in common." You would indeed have strange bedfellows on both sides of the two groups you want to look at. On your side you'd have folks like cranky-vermonter in there with you and others of the leftist persuasion in there with the Paleo-Libertarians. On the side that think the Federal effort justified, you'd find other types of Libs and Reagan Republicans, quite obviously including Reagan himself. My point is a) most Conservatives would not be in the camp that is critical of the federal effort to maintain the Union by force; b) you'd have big-government liberals on both sides; c) that there are strange bedfellows on both sides shows this is not a natural grouping that tells us anything about beliefs about the size and scope of the federal government since the largest group that believes in small government is on the wrong side for your thesis. My further point is that if instead of grouping people by whether or not they are critical of the federal effort to re-unite the Union, that you grouped them by whether or not they are critical of New Deal policies you would have a natural grouping. You'd have a natural grouping of liberals who believe in big government policies on one side and on the other Conservatives and non-libs who don't. In other words, this is evidence that the New Deal was more nearly a time that could be judged that the country started on the path to big government liberalism. This is why I think your thesis fails about how one views the CW is a reliable indicator of one's politics. You miss my point entirely. I'm not saying that "how one views the CW is a reliable indicator of one's politics." The very fact that I mentioned the existence of strange bedfellows would seem to belie that, and also implies that the politically odd company on one side of the issue would necessitate similar odd company on the other (Reagan Republicans and liberal Democrats, for instance). You mentioned speculating about why some don't entertain the idea that force was justified in saving the Union. I offered my own speculation and I think it's valid. The primary thing that those people have in common is that they are decentralists. "this is evidence that the New Deal was more nearly a time that could be judged that the country started on the path to big government liberalism"
As Hummel puts it, compared with the subsequent growth in government during the New Deal and Great Society periods Civil War/Reconstruction era growth seems minor. But when measured against the size of government before the conflict the growth is monumental, and it cannot all be ascribed to the war economy. "I have a hard time with the way you seem to be interested in American history no more than it aligns with your favorite thesis"
My ideas about this have come from reading history, not the other way around. The list of works I've read on this subject runs the gamut of views from Marxist to neo-Confederate, and because of this reading my views on the thing have changed over the course of the past 15 years or so. Rob, how am I missing your point? We know the politics of the those who wish for centralization don't we? Yes we do. You are using some private unspecified meaning when you talk about "decentralists." If you don't specify what you mean by this, your statement is meaningless. For example, people that want Obamacare --big gov Liberals--are those who believe in centralization. Their characteristics have been remarked on for years. But if you think the rest are decentralists in the sense that the US should be a loose collection of states you're mistaken. And you are mistaken that the US was a loose collection of states before the CW in the first place. The devil is in the details and you don't wish to argue the details so you are left making assertions you don't wish to discuss. Didn't Hummel say that the growth of government under the New Deal was trivial in comparison to *WWII*? Aren't you misquoting him? No, I stated it above: people who have a "suspicion of and resistance to federal government centralization/aggrandizement of power." Decentralism is, of course, a continuum, but that does not negate my observation. "The devil is in the details and you don't wish to argue the details so you are left making assertions you don't wish to discuss." Heh. Suddenly I've moved from WWWtW to the Psychic Network. Now that you've read my mind, can you tell me what color shirt I have on today? "Didn't Hummel say that the growth of government under the New Deal was trivial in comparison to *WWII*? Aren't you misquoting him?" Don't have the book with me, but if I remember the quote correctly, I think he states that that Civil War growth might seem "feeble" (I'm fairly sure that's the word he uses) compared to the New Deal and the Great Society, but that when compared to the size of antebellum government the increase is substantial. I can provide the exact quote later today. I don't make a habit of intentionally misquoting scholars, despite your continued implications that I'm debating in bad faith. This says nothing about how one would pick out these people. How one would know who they are. How would you make a survey to find out who is suspicious of "aggrandizement of power"? In other words, what does that mean"? Look, there is a category of people that belive in centralization of power. They are called Liberals. This is well known. But you aren't talking about this group because many Liberals think like you do. Secession had nothing to do with slavery, the war was unjust, Lincoln was a tyrant, the was was about industrialization/agrarianism, and on and on. So if it isn't Liberals you're talking about, then what beliefs tie these folks together in terms that actually mean something publicly communicable? I'm just asking basic details about your thesis that they'd have a certain ideology in common. These isn't an unreasonable question to ask. Perhaps this is what you had in mind: ". . . the growth of government under the New Deal was trivial in comparison to its growth during the United States' next major conflict: World War II." Here is the reference. I am not accepting or endorsing his "war is the problem" sort of view, however. Ike was wrong about the "military/industrial complex." The social welfare state is what is destroying the nation, not the military. Look at any economic chart. When did that begin? During the CW? Um . . . no. And these "the CW was the turning point" to the socialism assertions without any supporting evidence whatever by the usual suspects follow a logic identical to this: "If I hadn't gotten married my daughter wouldn't be dating a bum." If no reasons for why this is true need be given, one could just as easily pick the Revolution as when the die was cast that we were headed down the socialist path. And I just asked if you your quote was accurate. How is that insinuating that you are arguing in bad faith? The absurdity of the statement you made by your misquote should have been a clue that it was incorrect. First of all, that's not the quote I have in mind. The one I'm thinking of comes earlier in the book, not in the epilogue. I have it jotted down on an index card in the book, and will locate it. "I'm just asking basic details about your thesis that they'd have a certain ideology in common." But my point is exactly that they don't have an ideology in common, hence my description of them as strange bedfellows. If their ideologies were the same you'd expect them to have similar views of the thing. What I'm saying is that despite differences in ideology, what they do have in common is a strong decentralist sentiment or tendency. This is why I said that an examination of this common thread might be instructive. "From the perspective of the Franklin Roosevelt New Deal or Lyndon Johnson's Great Society, post-Civil War government may seem feeble, especially if one focuses on the the Supreme Court's rear-guard and half-hearted restraints on federal authority. To truly appreciate the immensity of the postwar gains in power, one must measure them against the virtually non-existent central, state, and local governments that preceded the conflict." pp. 348, Emanicpating Slaves, Enslaving Free Men, Jeffrey Rogers Hummel. what they do have in common is a strong decentralist sentiment or tendency. What is a "strong decentralist sentiment" in actual fact? I have no clue. Belief that the US is an imperial power in some way? A desire for deindustrialization? Are they simply Paleo-Libertarians? If you can't describe the one thing you say they have in common explicitly, then I don't see how can you say they have anything in common. To truly appreciate the immensity of the postwar gains in power, one must measure them against the virtually non-existent central, state, and local governments that preceded the conflict. Yeah I know. The ties holding the states together were very fragile you see, to it becomes easy to explain why the Union broke apart. If state loyalties had always been stronger than national loyalties, then differences between states made a powerful central authority inappropriate and impossible you see, and therefore the federal government had always been weak and inactive before the war. But the story goes on . . . it emphasizes how the success of the federal forces in the Civil War finally established the principle that the Union was sacrosanct and perpetual, while the undoubted expansion of federal power during the conflict created centralized institutions that the Union never previously had. And therefore the nation –-based on a true American nationalism-- developed only after 1860 because of four years of bloody war. The Birth of a Nation . . . I think we all know this narrative. Discussion of such narratives is interesting, repeating them is not. "I think we all know this narrative. Discussion of such narratives is interesting, repeating them is not." Fascinating. So you're saying that neo-Confederates and Lost Causers follow the same narrative as anti-racist libertarians like Hummel? Facets would include (but are not limited to) a tendency towards favoring localism in both business and government vs. distant production/control, a suspicion of accumulation of wealth/power in both business and government, a critical appraisal of industrial/corporate capitalism, and a resistance to mass media and mass culture. The website Front Porch Republic is an excellent clearinghouse for decentralist thought of various stripes. Generally speaking it's not a debate site, however, as it tends to emphasize commonalities over differences. When debate does occur there it's usually quite civil. Rob, sorry for the delay. Yes I would say that. I have said before that if there is one accepted narrative on all sides that is it. I think the Lost Cause narrative has a very wide currency. The most popular novels and movies dating from 1915 to the present show this. People paid money to see these compelling stories and believed them. I think the LC has provide a grab bag of ideas that sustains a few other ideologies (I don't use this pejoratively) that have survived the decline in belief (or ignorance of or indifference to) the LC itself. Hell, I believed it until recently. Honestly. I've mostly studied the CW to this point, and I didn't know squat about what the nation was like before. You have to believe something, so in absence of real knowledge you grab onto popular narratives. Now that I have begun to look at the time from the Revolution to the CW it seems fairly obvious that it is entirely different than the narrative. You'd never realize that the nation formed a federal postal system that employed the most federal employees, and that revolutionized communications in its day much as more modern communications did later (telegraph, telephone, internet.) The trans-regional political parties and alliances across wide geographic distances. You'd never know that the powerful nationalizing movements in the 19th century swept the world, and wonder if this narrative is true ask yourself what was it that made America immune? The Union that was "
Ok, I get what you mean now by the term. Well look, I have a lot in common with these folks, and with you. I am for small government and local control as much as possible, and there is a very strong streak of Libertarianism in Conservatism. But for all that, and here is where the disagreement is, I have strong disagreements with many (some on this site) who take a Tocquevillian abstract take on America and accept Tocqueville's position on the nation uncritically. It is an important work, but with fawning and uncritical analysis, what is the point? People go off to college to learn what Tocqueville said about America, so Americans can know how to think about America. Because no one knows how to think of America like a Frenchman in a short visit. Tocqueville was right about a lot, and wrong about a lot. Tocqueville wasn't God. He put on his pants one leg at a time. I am so sick and tired of people quoting Tocqueville who then stand back and smile as if nothing else needs to be said. Tocqueville's views are not sacrosanct, and need to be discussed not merely repeated. What does this have to do with our disagreements? A lot. The narrative I described about the America that wasn't really a nation until the CW borrows heavily on what was originally a Lost Cause thesis, and the latter went far more mainstream than you seem to know. Anyway, somehow the "almost not a nation before the CW" thesis definitely went mainstream many, many years ago, which would have been a shock to pre-war citizens of all stripes if they could have known that people would someday say this. In the group of people you describe that are suspicious of the Union's motives and the outcome of the war I do think there is a uniting element. I just disagree with you on what it is. I think it is the crowd invested in the "decline of the west" thesis. Whether the attraction to this "decline" thesis is conservative religion, Tocquevillian critiques of Democracy, Leftist cries that the nation was racist by design and intent, the Green movement, enemies of capitalism, enemies of industrialization, etc. What do they have in common? The "decline" thesis for varying reasons. Books have been written about this phenomena, and nobody invested in this thesis ever reads them. Decline thesis? What decline thesis? Anti-bourgeois? What is that? Never heard of it! In absence of actual knowledge, people grab onto the available narratives. The Lost Cause ideas undergird a narrative grab bag for "declinist" folks who suspect that Western culture is corrupt and has been for a long time. They think they are wiser than the rest in their cynicism, and need to think so. History is a drama where they are the important actors. Henry Adams is a prime example, and a cautionary tale. He ended his life as a smug bitter old man who thought he was smarter than everyone else. He was a brilliant loser, and he clung to being a loser to show how the world wasn't good enough for him. Just to be clear, when I said "if there is one accepted narrative on all sides that is it," I was speaking of the narrative I gave here. The "Birth of a Nation" thesis or the "virtually non-existent nation before the CW" thesis. You err if you believe that the group of folks in your first sentence is necessarily coterminous with the group of folks in your second. Not all "declinists" are cynical, nor are they all equally pessimistic. Don't be fooled by thinking Robert Penn Warren's problem is with the Civil War. He has large problems with the Revolution too. His Calvinistic critiques combined with a thoroughly Tocquevillian understanding are something you should understand. It all adds up though. Your use of the term "decentralist" seems to be pure Tocquevillian, and the agrarian/industrial dichotomy you emphasize is redolent of the Chapel Hill Progressives vs. Vanderbilt Agrarians / Agrarian Manifesto stuff that Warren was embroiled in. I think few buy into that stuff anymore. It had an influence for only a few short years that largely ended after WWII. Though DIA is deservedly a classic and he does get a number of things right, at the end of the day it isn't a coherent political philosophy. Maybe "declinist" wasn't the right word, but the debate with the Tocquevillians is the same one as we're having. That was my point. On the topic of an American Civil War reading list mentioned above, for posterity's sake (meaning google bait), I have a very important addition to my reading list above. But these books are not in fact additions at all, because in the context of the discussions here there are a few books that are far more relevant and necessary to know. In other words, when it comes to politics it answers the big question most that come to this blog want to know, or think they do know, rather than military or cultural history. If the latter is close to your heart, then by all means read all that has been recommended above, by me and others, and add these to your list. However, many who participate at W4 have an interest in one question, as they should. Namely, was the Southern Confederacy a model in any way of a Constitutionally purer form of government than the Union, or even the U. S. now? That is the frequent claim after all, or the suspicion given the power of the narratives handed down to us. But is it true? In theory or fact, in past or present? If this matters to you, then here are the books you need to read. It is an amazing fact that for well over 100 years the word of Jefferson Davis was taken as fact, and no scholarship whatever was done. I don't take book recommendations lightly --there are no throwaways here and I respect the time I'm asking you to spend. There are others, but these raise the relevant questions. Enjoy. -Southern Rights: Political Prisoners and the Myth of Confederate Constitutionalism - Mark E. Neely Jr.
"The Southern Dream of a Caribbean Empire," by Robert E. May, especially the masterful later chapter "The Secession Crisis." "Behind the Confederate Lines," by Charles W. Ramsdell (a student of William Dunning) on the economic and social aspects in the South of secession and war.